Nokia’s latest Symbian Phones, the Nokia 700 and 701 have started to ship and are already for sale in Thailand and possibly elsewhere. These phones are running Belle, the latest iteration of the Symbian OS. As there are leaked copies of Belle firmware for the Nokia N8 floating around on the Web so many Nokia power users are also already runing the OS. However, Belle users who are also fans of Opera’s mobile browsers got a nasty surprise when they tried to run Opera Mini or Mobile. Both Opera browsers failed to launch on Belle with a “feature not supported” error. Opera Software came up with a fix today with two new releases; Opera Mobile 11.1 Update 2 for S60 and Opera Mini 6.1 Update 2 for S60. The new versions fix the startup issue on Belle and also offer improved integration with the half-screen keyboard on phones running Symbian Anna. They can also be installed on devices running earlier Symbian versions. You can download the updated Opera browsers at m.opera.com using your phone or opera.com/mobile/download/versions/ from a PC. This entry was posted in Browsers and tagged Opera Mini, Opera Mobile, Symbian Anna, Symbian Belle by Dennis Bournique. Bookmark the permalink. 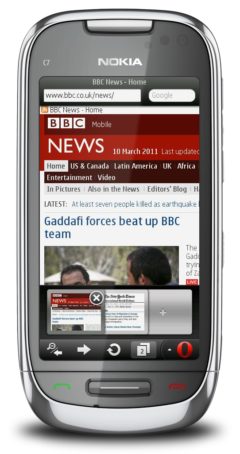 The new Symbian Belle has attractive icon design and font, a better web browser plus updates to other Nokia services, a portrait-style QWERTY keyboard, and split-screen text entry.